Beauty can be found in the most commonplace. I was struck the other day by the perfect patterns created by a preening Mallard. Appreciation of the ordinary in a new light can be as fulfilling as a many a birding experience. Each feather was attended with care by the drake and each fell back perfectly into its allocated position. Having recently re-feathered after the eclipse stage, his feathers were in pristine condition and he seemed keen to keep them that way. It is not easy to study feathers close up. Either they are on the bird and as such unreachable, or a dropped feather which is useless as a single entity. 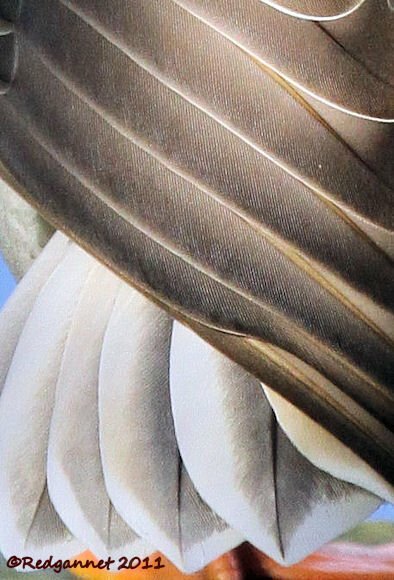 Being able to see the way that they fold together and slide across each other in a superbly designed pattern enables us to see the marvel that is a wing. …I really enjoyed this post. 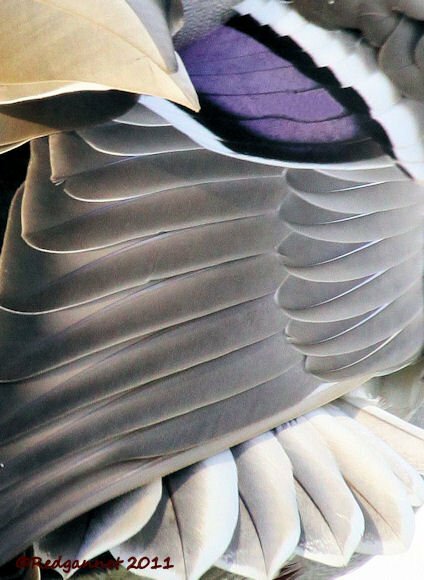 The feathers are gorgeous–I always love studying the shadows and patterns. Man, and you haven’t even depicted the male’s beautiful head or their curly central tail feather. Yupp, mallards are the hummers of the dabbling world.